The flyback chronograph P'6920 Rattrapante Limited Edition from the luxury brand Porsche Design has just received a sought-after award at the international Red Dot Award Product Design 2010 competition. The P'6920 has been honoured in the category "watches and jewellery" with the "red dot" seal, recognised around the world for high design quality. The awards are handed out each year by an international jury of well-known design experts. This year more than 1,600 companies from 57 countries entered the competition. The award ceremony will take place on July 5th, 2010 in Essen (Germany). "Porsche Design focuses on technically inspired products with a timeless, functional and purist design", said Dr. Juergen Geßler, CEO of the Porsche Design Group. "We do not follow fashionable trends, instead we offer our customers longlasting products which are created to be lifelong companions. Trends come and go - design endures. Our products do without bells and whistles. They are always credible and genuine. Since the foundation of the brand, we have already won more than 130 national and international awards and we regard this as our duty." The Porsche Design P'6920 Rattrapante Limited Edition is a mechanical flyback chronograph, which is available in a limited edition of 200 watches in the titanium version. 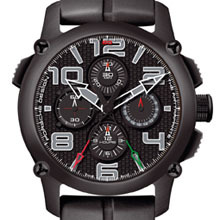 The chronometer allows the user to precisely measure and display intermediate times as often as required. The Rattrapante has a striking 45 millimetre casing which is made of titanium, a metal known for its light weight and resistance to corrosion. The casing gets its black surface thanks to PVD technology: this vacuum- based process causes a matt black layer of metal nitrides to condense, protecting the watch from external influences. The sapphire glass back provides a view of the Valjoux 7750 automatic mechanism with Porsche Design rotor system. Additionally the flyback chronograph comes with a certificate of precision issued by the Contrôle Officiel Suisse des Chronomètres (COSC) and offers a power reserve of 48 hours. "The P'6920 Rattrapante Limited Edition combines venerable Swiss watchmaking with the purist Porsche design in an exceptional way", says Patrick Schwarz, CEO the Swiss watchmaking company Eterna SA, the licensee for the production and sale of Porsche Design watches. "The split-second mechanism is a complicated function which is not easy to realise." Porsche Design is a luxury brand with a particular focus on technically inspired products. The brand was founded in 1972 by Ferdinand Alexander Porsche, whose products have stood for functional, timeless and purist design ever since. The product portfolio includes classic men's accessories, a sports and fashion collection, electronic products as well as a men's fragrance line. The products are designed in the Porsche Design Studio in Zell am See, Austria and sold around the world in the company's own stores, shop-in-shops, high end department stores and exclusive specialist retailers. The venerable Swiss watchmaking company Eterna SA. 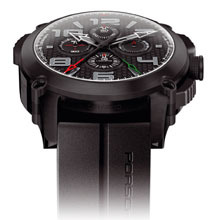 is the licensee for the production and sale of Porsche Design watches. Movement/functions: calibre Valjoux 7750 AR2; self-winding mechanical chronograph with split-second mechanism, certificate of precision; power reserve 48 h; 28'800 A/h; 29 jewels; 13 1/4 lines; hours, minutes and seconds; date indication; double-sided winding system with energy-optimized Porsche Design rotor designed by Eterna for the P'6910 Indicator. Dial/hands: black with honeycomb pattern; 30-minute-counter at 12 o'clock; 12- hour-counter at 6 o'clock; small seconds at 9 o'clock; date indication at 3 o'clock; rhodanised bar indices and Arabic numerals as well as white skeletonised triangular centred hour and minute coated with grey luminous material; black centred second with red tip and black centred fly back hand with green tip; black chronograph counters and date indicator with red and white accents. Case/back: satin-finished and shot-blasted titanium case with black PVD coating, combined with titanium bezel and case back with black PVD coating affixed with four screws; black PVD-coated titanium push-buttons in the design of the pedals of a Porsche Carrera GT; cambered, dual anti-reflective, scratch-resistant sapphire crystal with white printed minute track; anti-reflective sapphire case back; water resistant to 50 m; diameter: 45 mm; height: 15.5 mm. Strap/clasp: black natural caoutchouc strap with inside moulded in the profile of a Porsche Carrera GT; shot-blasted folding clasp in black PVD-coated titanium.